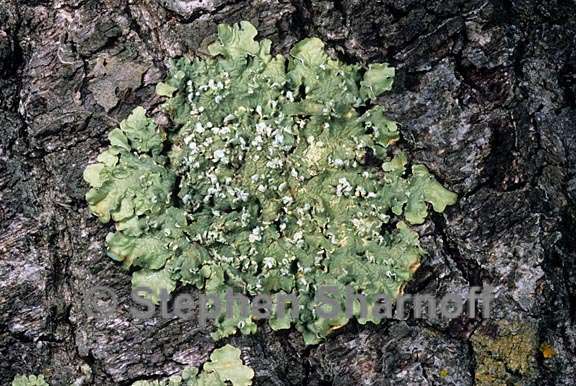 Thallus: foliose, appressed to tightly adnate, to 12 cm wide, lobate lobes: linear, sublinear or subirregular, contiguous or very rarely separate, plane, 3-8 mm (-12 mm in specimens from California Channel Islands) with apices rounded upper surface: pale green, yellowish green to greenish yellow, turning dull yellow to brownish with age in the herbarium, smooth to weakly wrinkled and rugose, rarely weakly ridged-reticulate, frequently with white maculae, rarely with a few marginal laciniae or pruina pseudocyphellae: absent or rare and very small, punctiform soredia: white, farinose to granular, covering reflexed, "crescent-shaped" lobe margins or irregularly along the lobe margins, infrequently with laminal soralia medulla: white with a continuous algal layer lower surface: smooth to finely wrinkled, dark chestnut brown to black, sometimes paler toward the margin; rhizines: simple, rarely branching, short, concolorous with the lower surface, sometimes with white tips, usually absent in a zone along the margins Apothecia: rare (often immature); disc: pale to dark rusty-brown; exciple: becoming sorediate asci: Lecanora-type, 8-spored ascospores: simple, hyaline, ellipsoid, 9-12 x 57 µm Pycnidia: black, rare or absent conidia: appearing straight filiform or bifusiform, 7-11 µm long Spot tests: upper cortex K+ yellowish, KC-, C-, P-; medulla C+ red, KC+ red, K-, P- Secondary metabolites: upper cortex with usnic acid (minor); medulla with lecanoric acid (major), +5-chlorolecanoric acid (minor or trace). Substrate and ecology: on bark and wood of angiosperms (Acacia, Acer, Canotia, Ceanothus, Cowania, Fraxinus, Fouquieria, Heteromeles, Juglans, Nolina, Prosopis, Prunus, Quercus, Rhus, Robinia, Salix, Yucca), conifers (Abies, Cupressus, Juniperus, Picea, Pinus, Pseudotsuga) and very rarely on rock from 270-3200 m World distribution: temperate and boreal areas of North America and southern South America, South Africa, India, Russia and Japan Sonoran distribution: Arizona and southern California, including the Channel Islands, Baja California, Baja California Sur, Chihuahua and Sonora. Notes: The lobes of F. soredica are generally narrower than those of F. flaventior. Concentrations of 5-chlorolecanoric acid tend to be greater (scored as minor rather than trace amounts) in F. soredica (70%) when compared with its occurrence scored as minor in F. flaventior (22%). See also notes under F. flaventior for comparison with F. soredica.